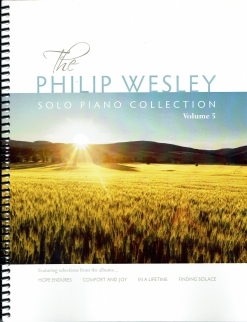 Beyond Cloud Nine is the companion sheet music book for Philip Wesley’s 2016 recording by the same name. All sixteen pieces from the album are included, transcribed note-for-note from the piano parts of the orchestrated album. At least partly because the recorded music was orchestrated, the sheet music is somewhat easier than some of Wesley’s other songbooks. 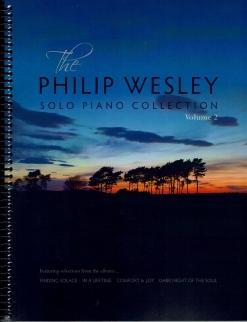 The solo piano versions sound somewhat different from the orchestrations, but since the piano is front and center on the recorded tracks, the differences are not dramatic and the sheet music sounds fine and is fun to play. 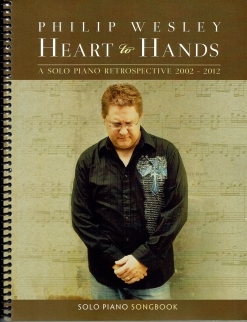 The songbook is spiral-bound and printed on a medium-weight paper stock that should last for years of usage. The covers are full-color reproductions of the album artwork and the sheet music itself is well-spaced and easy to read. Pedaling suggestions are included, as are the metronome settings. Phrasing is clearly marked. There are few, if any, reaches of more than an octave, and most of the timing is straight-forward and easy to count. A few pieces have somewhat challenging key signatures, but most are uncomplicated. Wesley’s music has frequent time signature changes, but that doesn’t make the music more difficult to learn. Pianists at an upper-intermediate playing level should be able to master most of these pieces. 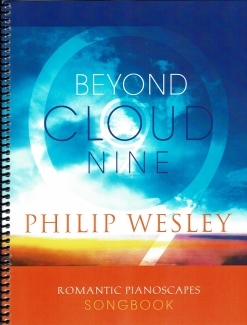 The sheet music for Beyond Cloud Nine is available exclusively from www.PhilipWesley.com and is available as a printed or downloadable book as well as individual PDF’s for each piece.